We have served this at a few events including Tour de Chocolat and BAW Night at Fort Jesse Cafe and it's always a hit. All ingredients available in store! Our Spice Island is perfect for only getting the amount of spices you need so they stay fresh and you aren't stuck with a whole bottle of something you'll never use again. But this will likely turn into a recipe you'll make over and over! In a large skillet, heat oil over medium heat. Add onions and garlic and sauté until onions become soft and translucent, about 10 minutes. Add the celery and chile, cover and cook for another five minutes more. Reduce the heat and stir in spices, (cumin, oregano, cinnamon, cloves, coriander, chili powder, black pepper, salt) along with the bell peppers. Cover again and cook for another five minutes. Stir often to keep the spices from burning. If the pan gets too dry add a little liquid from the diced tomatoes, or some water. Next, add the black beans, tomatoes, lime juice (if using) and soy sauce. Let the chili simmer on low for 5 to 10 minutes, until it thickens slightly and flavors combine. 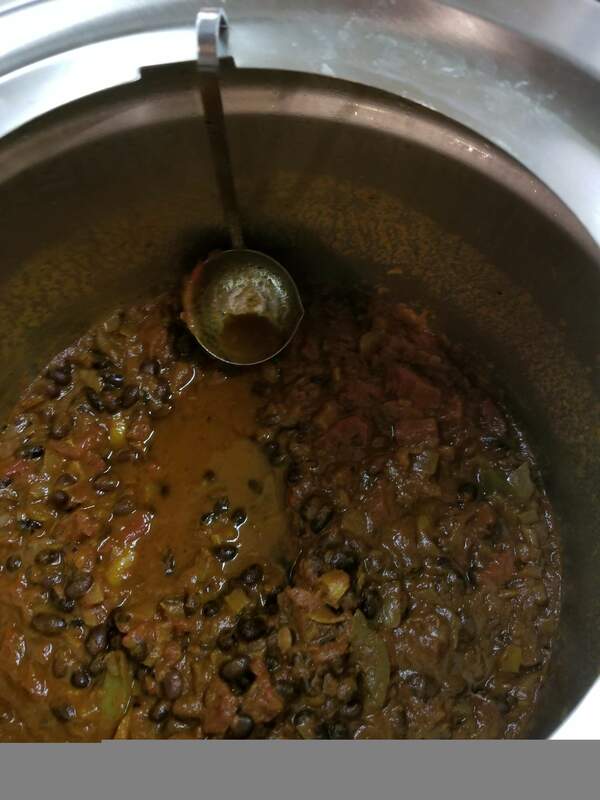 If using dry soaked black beans, cook about 30-45 minutes but test that the beans aren't getting overcooked. Stir in the chocolate. When chocolate has melted, taste to adjust the salt and pepper. Serve with topping of your choice. I like a bit of vegan cheese, sour "cream" and scallions.